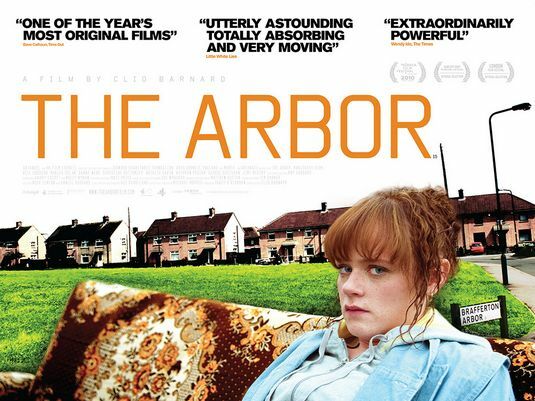 Clio Barnards first feature film The Arbor (2010) is the story of the working class Bradford playwright Andrea Dunbar (1961 – 1990) best known for Rita, Sue and Bob Too an autobiographical drama about the sexual adventures of two teenage girls which was adapted into a movie in 1986 directed by Alan Clarke. Dunbar lived in a rundown council estate in Bradford Yorkshire. At the age of 15 while still at school she was encouraged to write her first play also called The Arbor after Brafferton Arbor, a street where her family lived. 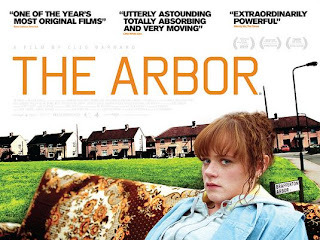 Andrea Dunbar was a single mum with three children by three different men and Clio Barnards film highlights her strained relationship with her eldest daughter Lorraine, a heroin addict who in 2007 was convicted of manslaughter for causing the death of her own child by gross neglect, which was the only mixed race child living in prime BNP territory. She blamed her problems on her upbringing and how her mother’s heavy drinking affected the sibling’s lives. The film uses actors performing lip-synching to pre-recorded interviews with Andrea, her family and friends. It’s a technique known as verbatim theatre a process the director said in an interview “to create a deliberate gap between reality and representation or at least make you aware of the gap”. Dunbar died of a brain haemorrhage at the age of 29 in a pub called The Beacon. The film raises the social issues introduced in her writings with all its raw emotions. Most striking parts of this “documentary” are the ones performed in the grounds of the Buttershaw estate surrounded by today’s tenants. The movie is uncomfortably realistic and certainly not a comfortable watch, but well worth the effort.